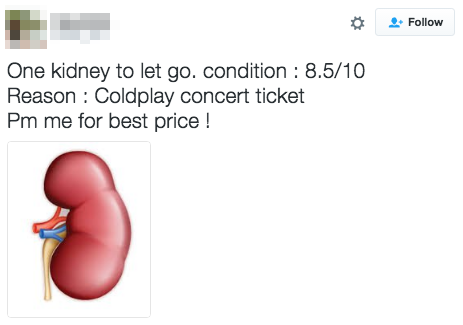 People Are Offering Their Kidneys And Selling Coldplay Tickets At RM20,000 Each! Citibank members were entitled to purchase tickets for the Coldplay's 2017 show ahead of everyone else in a special pre-sale that was planned for 17th until 19th November. However, all of the 12,000 tickets were sold out within an hour yesterday, 17 November! "When you try your best, but you don't succeed..."
According to show promoter Live Nation Lushington's managing director Michael Roche, there were 5,000 to 6,000 users trying to make transactions at any one time. 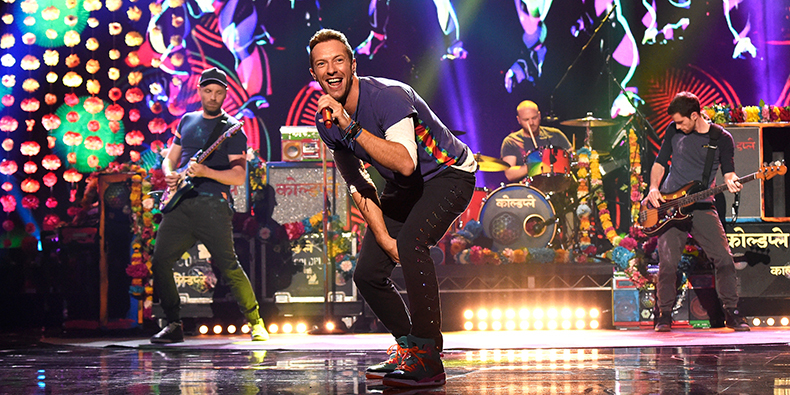 The news that the first batch of pre-sale tickets were gone in less than 60 minutes came as a disappointment for many fans in the region, particularly Malaysians, have been hoping to head to Singapore on 1 April 2017 to watch Coldplay for one last time before the band goes on an "indefinite hiatus". 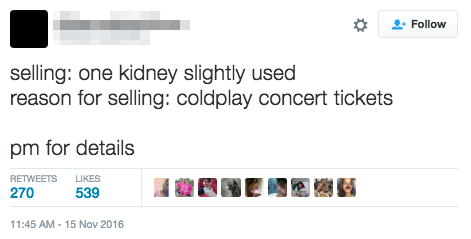 Unfortunately for Malaysia, Coldplay will only be heading to Singapore, Philippines, Taiwan, South Korea and Japan for the Asian leg of its tour. 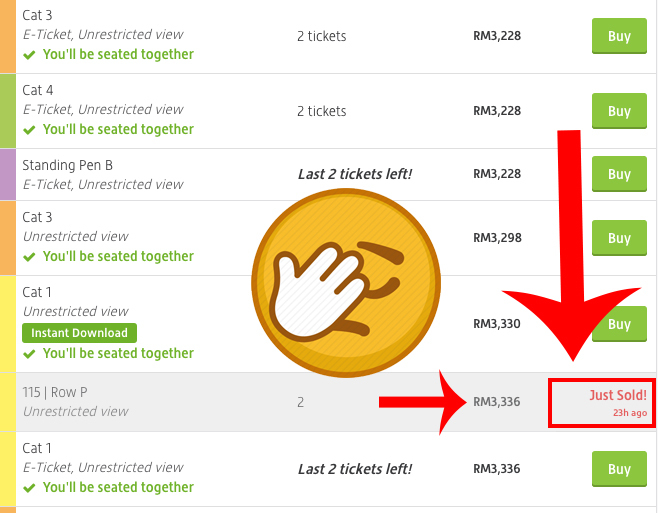 A quick check on ticket marketplace Viagogo shows that many fans were willing to fork out up to a few thousand ringgit just to buy tickets from these resellers. 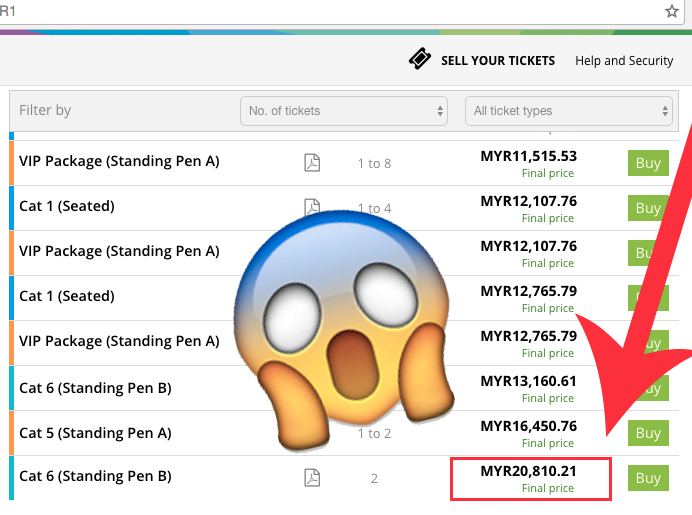 If those tickets were bought through Sports Hub Tix, the official site, they will only cost SGD78 (RM240) to SGD298 (RM914) each at most. But all hope is not lost yet. For those who are still looking to get those tickets, here's your chance. Live Nation Lushington subscribers will be able to gain early access to purchase pre-sale tickets on Sunday, 20 November, one day before the sale goes public on Monday, 21 November. A newsletter will be sent on 19 November to all subscribers. This newsletter will contain an exclusive code that'll allow early ticket purchases on Sunday, from 10am to 11.59pm. Subscribe to Live Nation Lushington's mailing list here before 19 November to get the pre-sale access code. Get ready, everyone. ALL THE BEST! It was like a teenage dream come true!